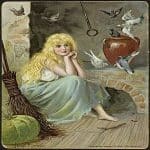 The Classic fairy tale of Cinderella-a young girl, mistreated by her step-mother and step-sisters, finds out that dreams really can come true. This is the Fairy Tale story of Cinderella. It is brought to you by Stories to Grow by. Once upon time a girl named Cinderella lived with her stepmother and two stepsisters. Poor Cinderella had to work hard all day long so the others could rest. It was she who had to wake up each morning when it was still dark and cold to start the fire. It was she who cooked the meals. It was she who kept the fire going. The poor girl could not stay clean, from all the ashes and cinders by the fire. One day, big news came to town. The King and Queen were going to have a ball! It was time for the Prince to find a bride. All of the young ladies in the land were invited to come. They were wild with joy! They would wear their most beautiful gown and fix their hair extra nice. Maybe the prince would like them! One day, big news came to town. At Cinderella’s house, she now had extra work to do. She had to make two brand-new gowns for her step-sisters. “You call that a dress?” screamed the other. “What a laugh!” said one step-sister. “Such a mess!” They pointed at Cinderella. All of them laughed. Soon the time came for the stepmother and step-sisters to leave for the big party. Their fine carriage came to the door. The stepmother and step-sisters hopped inside. And they were off. “Good-bye!” called Cinderella. “Have a good time!” But her stepmother and step-sisters did not turn around to see her. All of a sudden, in front of her was a fairy. “You called?” said the fairy. “Yes, you did,” said Cinderella. “You do look a bit of a mess, child,” said the Fairy Godmother. “Even if I had something nice to wear," said the girl, "I would have no way to get there." “Dear me, all of that is possible,” said the Fairy. With that, she tapped her wand on Cinderella’s head. At once, Cinderella was all clean. She was dressed in a beautiful blue gown. Her hair was set up high on her head inside a golden band. “This is wonderful!” said Cinderella. “Dear me, all of that is possible,” said the Fairy Godmother. “Who said I was done?” said the Fairy Godmother. She tapped her wand again. At once, a beautiful carriage came to be, with a driver and four white horses. “Am I dreaming?” said Cinderella, looking around her. “Then I must be sure to leave the ball before midnight!” said Cinderella. “Good idea,” said the Fairy Godmother. She stepped back. “My work is done.” And with that, the Fairy Godmother was gone. She stepped into the carriage. And they were off. “I know, Mother,” said the Prince. Yet he knew something was wrong. He had met many of the young women. Yet after he said “hello,” one by one, he could find nothing more to say. All heads turned. Who was that lovely maiden stepping down the stairs? She held her head tall and looked as if she belonged. But no one knew her. “There is something about her,” said the Prince to himself. “I will ask her to dance.” And he walked over to Cinderella. “Have we met?” said the Prince. “I am pleased to meet you now,” said Cinderella with a bow. But all the Prince could see was Cinderella. They laughed and talked, and they danced some more. In fact, they danced for so long that Cinderella did not see the clock. “Dong!” went the clock again. “Why does that matter?” said the Prince. “I must go!” said Cinderella. “I must GO!” said Cinderella. She ran to the steps. “Goodbye!” said Cinderella. Up, up the stairs she ran. “Please, stop for a moment!” said the Prince. “Oh, dear!” she said as one glass slipper fell off her foot on the stair. But Cinderella kept running up. “Please wait a moment!” said the Prince. “Goodbye!” Cinderella turned one last time. Then she rushed out the door. “Dong!” The clock was quiet. It was midnight. “This is all I have left from her,” he said, looking down at the glass slipper. From hut to hut, from house to house, went the Prince. One young woman after another tried to fit her foot inside the glass slipper. But none could fit. And so the Prince moved on. At last the Prince came to Cinderella’s house. “He is coming!” called one step-sister as she looked out the window. “At the door!” screamed the other step-sister. The first step-sister tried to place her foot in the glass slipper. She tried hard, but it just would not fit. Then the second step-sister tried to fit her foot inside. She tried and tried with all her might, too. But no dice. “Are there no other young women in the house?” said the Prince. “Then I must go,” said the Prince. “Maybe there is one more,” said Cinderella, stepping into the room. “I thought you said there were no other young women here,” said the Prince. “None who matter!” said the stepmother in a hiss. “Come forward,” said the Prince. “Maybe there is one more," said Cinderella, stepping into the room. Cinderella stepped forward and sat before him. The Prince got down on one knee and tried the glass slipper on her foot. It fit perfectly! Then, from her pocket Cinderella took out something. It was the other glass slipper! “Not HER!” screamed the other step-sister. “This cannot BE!” yelled the stepmother. But it was too late. The prince knew that Cinderella was the one. He looked into her eyes. He did not see the cinders in her hair or the ashes on her face. “I have found you!” he said. “And I have found you,” said Cinderella. And so Cinderella and the Prince were married, and they lived happily ever after.